When people find out I’m a wildlife biologist living and working here in the Greater Yellowstone Ecosystem, they’re quick to ask about wolves, grizzly and black bears, bison, elk, Rocky Mountain bighorn sheep, bald and golden eagles, trumpeter swans, and many other species they want to see when they visit Yellowstone and Grand Teton National Parks. Of course, people still want to see Old Faithful geyser and learn about the Yellowstone Supervolcano and caldera, but the big, charismatic wildlife species of Greater Yellowstone are popular with everyone. Many people are especially interested in seeing and learning about moose. A young bull moose along the Shoshone River, west of Cody. Photo by C.R. Preston. Moose are the largest member of the deer family that also includes elk, white-tailed deer, and mule deer in North America. Moose are big, cold-weather mammals that are able to wade through deep snow better than their cousins. They range through cool-temperate and subarctic forests in much of the Northern Hemisphere. 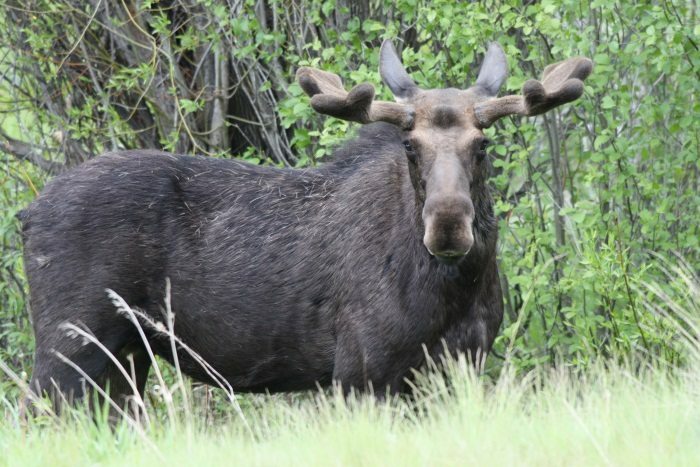 In North America, moose are found from Alaska and nearly all of Canada and the northern U.S., south along the Rocky Mountains to northern Colorado. Moose were fairly rare in the Greater Yellowstone Ecosystem until the late 1800s, but became more common when we began to suppress wildfires. Yellowstone area moose depend on mature, subalpine conifer forests for winter shelter and forage, and the natural fire regime in Greater Yellowstone prevented the development of large, unbroken tracts of mature subalpine conifer forests. With aggressive fire suppression, the Greater Yellowstone moose population expanded through the first 60 – 70 years of the 20th century. The Absaroka Range between Cody and Yellowstone’s East Gate. Photo by C.R. Preston. Beginning in the 1980s, Yellowstone moose began to decline. The fires of 1988 killed large stands of spruce in the region. The loss of forage, combined with the harsh winter of 1988 – 1989, was especially rough on moose. In the 1970s, there were about 1,000 moose in Yellowstone, but that number has dropped to less than 200 animals today. Consistent, low pregnancy rates indicate that low food availability is the primary source of the long-term decline, but predation by increased numbers of grizzly bears and wolves is also helping to limit population growth. Increased parasites and insect-borne diseases related to recent warming trends may also be a factor. One of the best places to see moose in the Greater Yellowstone Ecosystem is in the Shoshone National Forest between Cody, Wyoming, and Yellowstone’s East Gate. The spectacular drive west from Cody takes you past the Buffalo Bill Reservoir and along the North Fork of the Shoshone River. The stunning Absaroka Mountain Range frames the river corridor, and you climb gradually in elevation through sagebrush and Douglas-fir/limber pine woodland, until you reach lodgepole pine/Engelmann spruce forest near the East Gate. The distance between Cody and Yellowstone is 52 miles, with the last half winding through the Shoshone National Forest. April through mid-June is the best time to see moose along this corridor, but some moose are present year-round. Keep your eyes peeled for other wildlife, including grizzly bears, bighorn sheep, and elk. 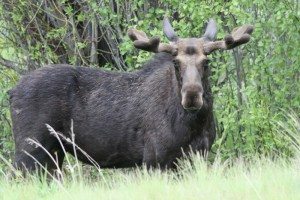 Other good places to see moose in Greater Yellowstone is in Grand Teton National Park near Jackson Lake Lodge, and in the drainages of Yellowstone National Park’s Soda Butte Creek, Pelican Creek, Lewis River, and Gallatin River. Dr. Charles Preston is Senior Curator at the Center of the West and Founding Curator-in Charge of its Draper Natural History Museum and Greater Yellowstone Raptor Experience.